So yes - I built something stupid again. Recently I discovered the awesomeness that is @Big Data Batman. This is a twitter account that simply copies tweets with “Big Data” in them and replaces it with “Batman.” It works as well as you may think - either lame or incredibly funny. (At least to me.) Here are a few choice samples. That last one is a bit subtle. 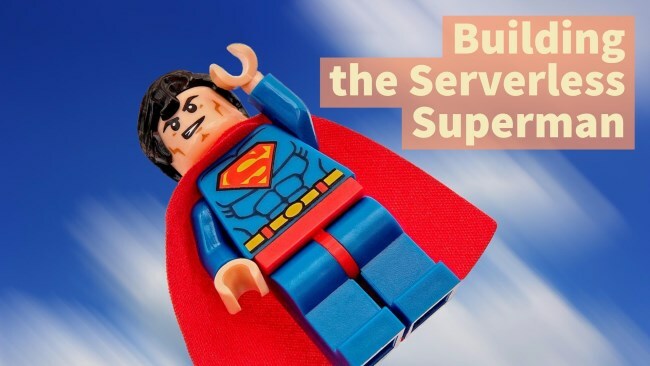 I thought it would be fun to build something similar for serverless, and obviously, I had to name it Serverless Superman. 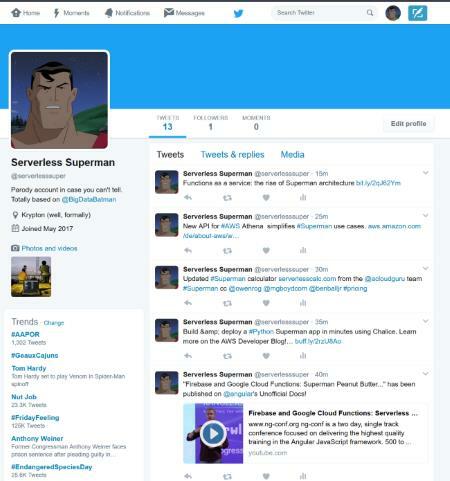 On a schedule, look for tweets about serverless from the last X minutes, X being the same as my schedule, find a random one, replace the word "serverless" with Superman, and tweet. As with everything complex I’ve done with OpenWhisk, my solution involved a sequence of actions. I began by plotting out my actions in text form. I named it “seq1” as I thought maybe I’d end up with multiple sequences, but one was enough. Let’s break this down action by action. The only real complex part here is since. The Twitter API lets you filter by date. Unfortunately you can’t filter by time. That’s going to be a problem later on but I’ll address that in the third action. Notice I’m using two keys related to my Twitter account. I got these by logging into the developer portal with my Serverless Superman account. This is an action I built as part of a public package. You can find the complete source code here: https://github.com/cfjedimaster/twitter-openwhisk. I’m not going to share the code since I blogged on it a while back, but I did have to update the package action to support the “since” argument. The purpose of this action is multifold. It’s main role is to filter the Tweets, but I also flatten the data quite a bit as well. I filter out retweets, replies, and items older than X minutes, where X is 10. Finally I return an array of results where I just carry over the id, text, created_at, and hashtags value of the tweets. One thing that kind of bugs me is the TOO_OLD value. Right now I have to ensure it matches my cron job (more on that later) and if I forget then I’ll have a issue with my data. It’s not that too bad of an issue and so I just got over it. Yeah, that’s a pretty dumb name. The idea for this action is - given an input of tweets, pick one by random and replace the word “serverless”. Here is where things get a bit wonky. Sometimes I found tweets where “serverless” wasn’t in the text. When I looked online, I saw them in the hashtags. Ok, so I updated my code in action 3 to include the hashtags. This is where I then discovered that the Twitter API seemed to not include all the hashtags I could see in the Tweet. So… I shrugged my shoulders and got over it. As you can see, I wrote a note that it would be good to not give up and select another Tweet, but I thought maybe Serverless Superman could just STFU for a bit and wait. Note that if I don’t have any Tweets or if I can’t find the word “serverless”, I reject the sequence. This is not the right thing to do. OpenWhisk does support conditional sequences but it’s a bit… complex right now. There is an open issue to make it a bit simpler and when that happens, I’ll consider updating the post then, but for now I dealt with it. It does mean, however, that my action is going to report errors when an error really didn’t occur. Finally - I send my Tweet. This is a new action in my Twitter package so I’ll share the code here. Nothing real complex here, but note I’m only allowing for text based Tweets. The API supports a lot more than that. Finally, you may have noticed that my sendTweet action requires multiple authentication tokens. How did I pass them? I didn’t. I simply used the OpenWhisk “bind” feature and made a copy of my package with all my tokens attached to it. Bam - done. wsk trigger create serverless_superman_trigger --feed /whisk.system/alarms/alarm -p cron "*/10 * * * * *"
I used https://crontab.guru to help me build the cron value. Then I made a rule that associated the trigger with the sequence I created of the actions above.